This presidential penthouse is of exquisite taste and design. Originally built for the developer’s use, this magnificent suite is now available for your deluxe pleasure. 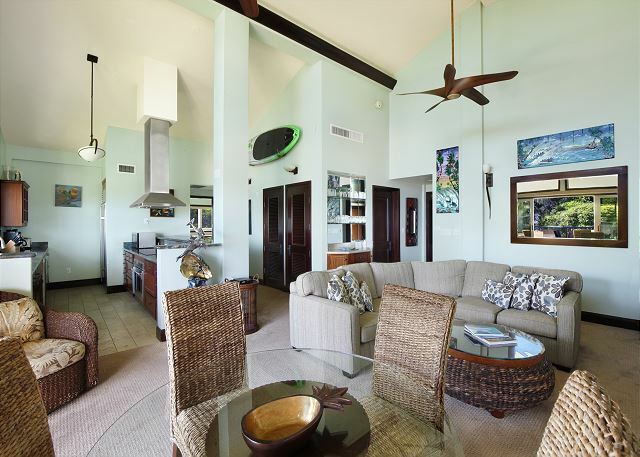 Stunning beach and ocean views set the Hawaiian ambiance, while original surf art by local artist, Steven Valiere, is highlighted by vaulted ceilings and Indonesian hardwood accents. 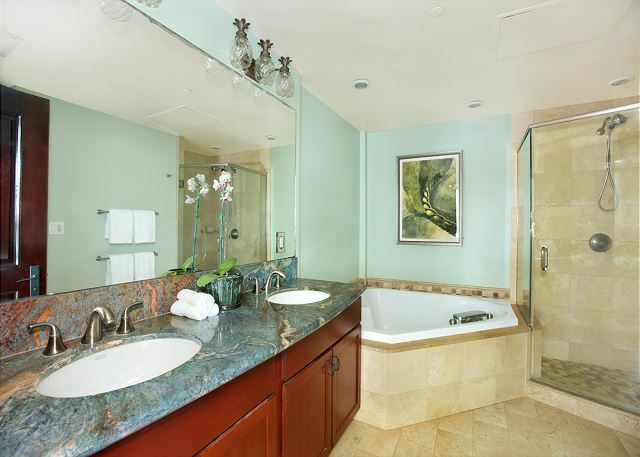 A private entrance leads to this 2 bedroom, 3 bath penthouse that comfortably accommodates four people. The largest of all oceanfront suites at Waipouli, a 19 foot glass wall and two lavish lanais enhance the open floor plan. 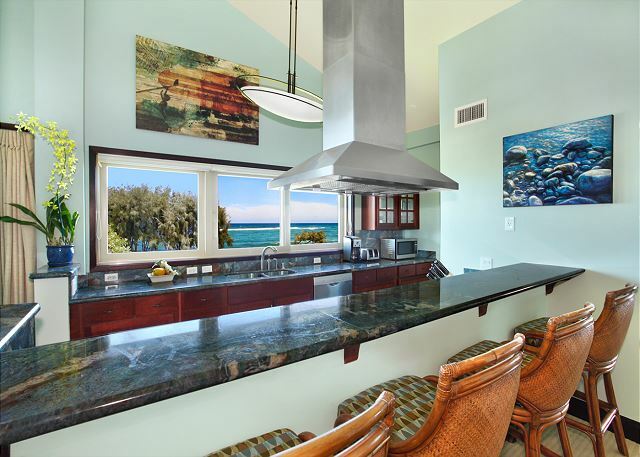 A gourmet kitchen is decked with new appliances, granite countertops and a modern bar with views. Enjoy custom interior design throughout and the choice of multiple lounging areas. 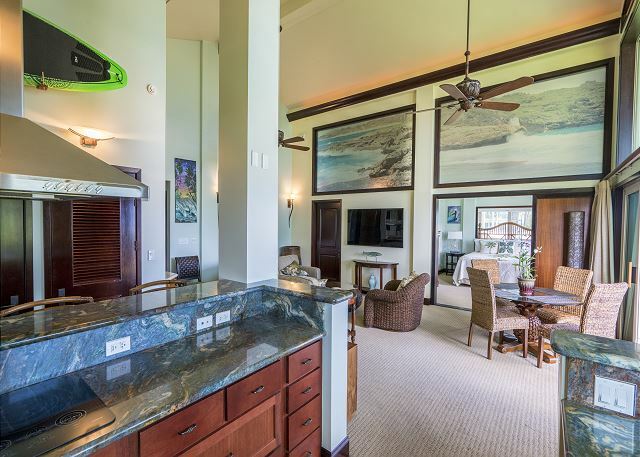 Completely unique and uninhibited, this penthouse provides a rare opportunity to live in high-end, Hawaiian style. This condo has a wonderful location. Not to far from airport. Walking distance to town and restaurants. Nice beach out front of the building. 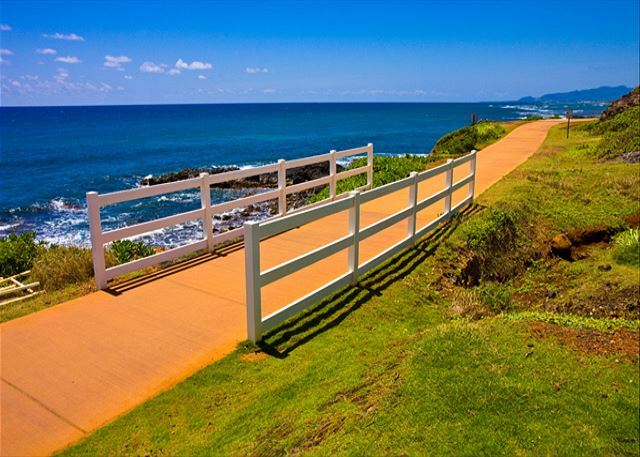 Nice walking path in fr of beach too. The untit is nice but furniture and fixtures are very tired. I would recommend to refresh the furniture! A wonderful place. This was our third year in a row in the same unit. We will be back next year. 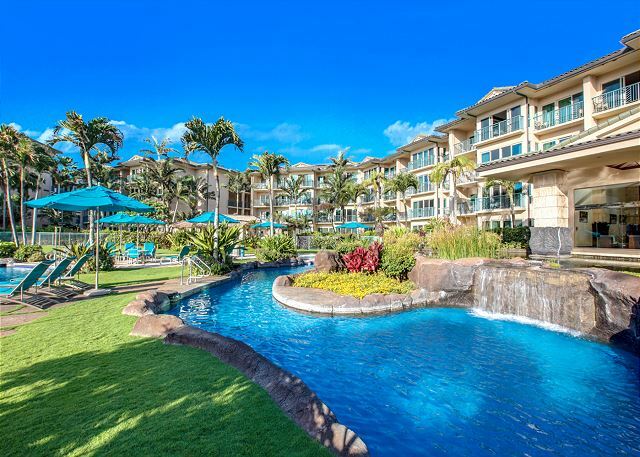 This condo we rented in Kapaa is gorgeous. The view is spectacular - you are literally steps from the beach. WOW! The exact phrase that was used when we entered Waipouli H201. 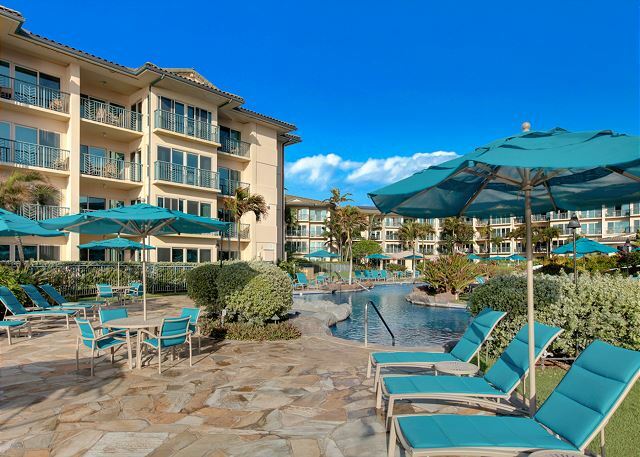 That, in addition to the service offered through Kauai Exclusive Management (KEM) made a vacation for our family that built lifetime memories for the 3 generations that attended. The phone app (RentalHost) used by KEM handled all of our needs and supplied suggestions from the initial booking, contract, payment, access codes and check-out guidance. The app was also used to request maintenance and this was taken care of within 12 hours (requested Saturday evening, resolved first thing on Sunday morning). The app also suggested nearby restaurants and items of interest. 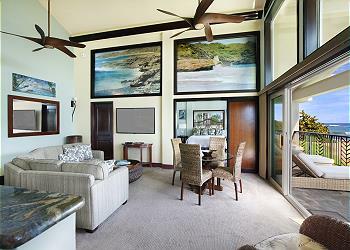 The Presidential Penthouse Suite is spectacularly furnished with a Hawaiian tropical theme and the view from the lanai supplied ocean views from sunrises through lunch and into happy hours with great space that accommodated our family (6 attendees) with ease. The modern appliances all functioned without fail. 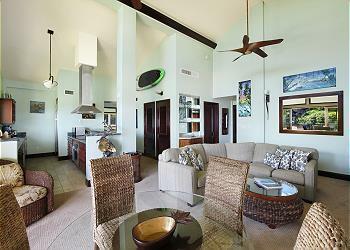 When we did leave the Suite to use the Resort amenities, the beach and lounging chairs were easily accessible. The pool and surrounding deck were always kept clean and it was a good place to meet people from other areas. 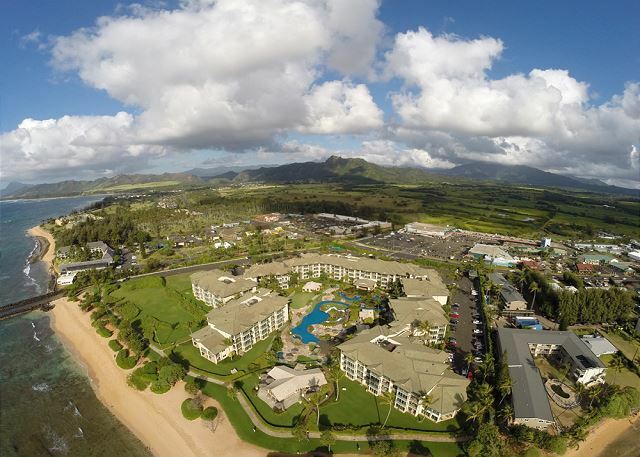 Waipouli Beach Resort is a great location that met our needs to be in the middle of the island and be able to get North and South areas of the island to take in some of what Kauai offers. We are looking forward to a return visit and vacation at Waipouli Beach Resort and using Kauai Exclusive to assist with another memory-making event. 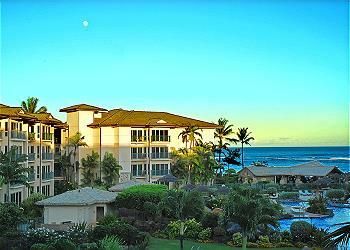 This was our 3rd stay at the Waipouli Beach Resort, but our 1st at this condo. We always admired this particular condo on our last 2 stays and when we finally got the opportunity to stay, it did not disappoint. Can't imagine staying at any other place when visiting Kauai. Amazing place and great hosts! We can not say enough positive things about our stay! We came to celebrate an anniversary and it was above and beyond our expectations. Truly a WOW experience and we are already looking at booking our next trip. The resort was beautiful and exactly what we were looking for. We stayed in G405 and H201 as we had a larger group of people. The only word we all could say about H201 was “Wow” for about the first 30 minutes when we walked in. We could not believe how beautiful it was as we kept going throughout the week. 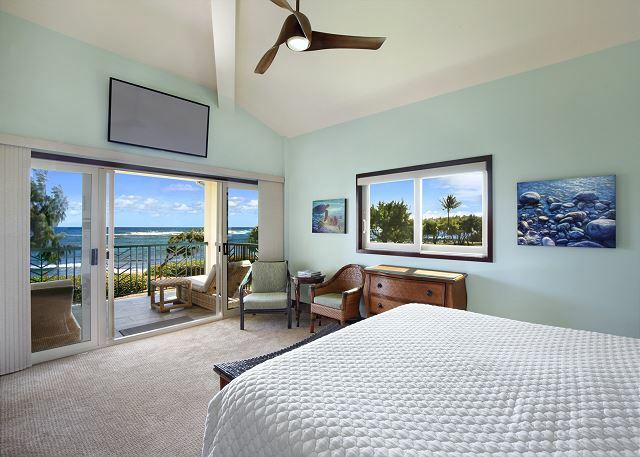 It has beautiful views of the ocean off the lanai perfect for views of the sunrise and sitting on at night to feel the breeze. The unit was luxurious and spacious, beautifully furnished and decorated, and it had everything we needed. 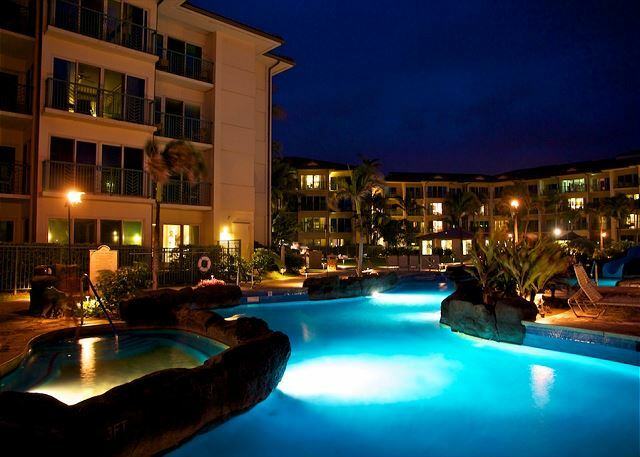 Having a relaxing pool with a lazy river and a slide with access to the beach truly has everything for everyone! 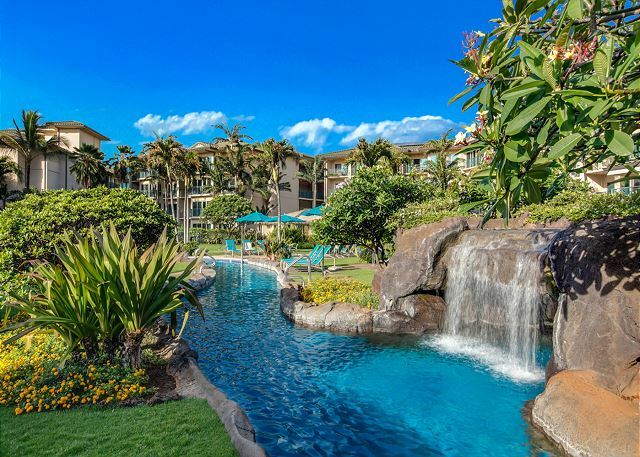 The staff at Kauai Exclusive who helped us book our trip was incredibly helpful and showed exemplary customer service throughout our trip. They were available whenever we had a question about our trip and were able to help with all of our questions. They use an app called RentalHost, and it was a lifesaver! It gave us all of our information about the rental unit, and gave us the ability to message our host with any questions we had. It also had a very helpful tool in the app to see restaurants near me or near my rental when we couldn’t make a decision. We had trouble working our AC in one of our units on a Sunday, and we used the app to get in touch with our host and they were responsive right away and came and fixed it immediately! The unit was excellent. The location as well. We will be back again. 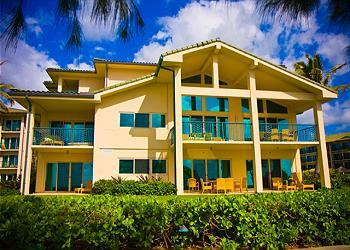 We had a wonderful stay at Waipouli Beach Resort H201. Unfortunately we had a lot of rain during our stay but the resort is centrally locates so we were able to visit the south and north shores easily depending on the weather forecast. The unit is in great condition and we had a fantastic view of the ocean and sunrise. Being near the restaurant was not a distraction at all, but nice to be able to hear the live music from the restaurant on Wednesday evenings from the lanai. Fantastic spot. Spacious and very clean and well maintained. Close to everything. Starbucks and the grocery store are right across the street. Highly recommend. We just spent 2 fabulous weeks in H201. Everything about this place is wonderful. We stayed there with another couple and the accomodations could not have been better. And the view! Spent every morning waiting for the sunrise to start my day. The patio was our favorite part of the place. But the inside is gorgeous and so clean. By far our best place we've ever stayed in Kauai. After spending an incredible week at this property, I agree that this unit has both a stunning beach and the best ocean view on the island. 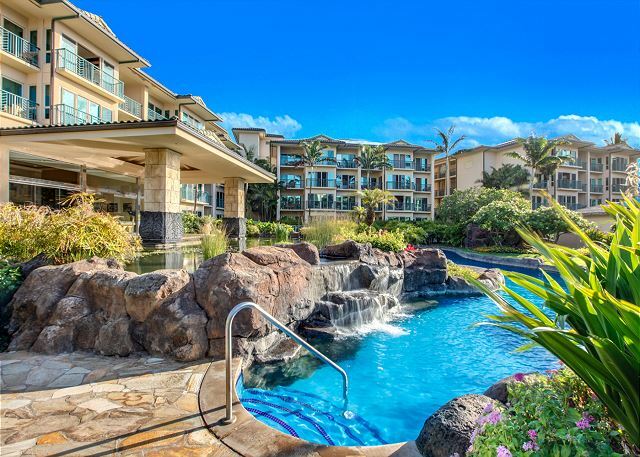 While the property speaks for itself, Kauai Exclusive Management were excellent hosts insuring the unit was in impeccable condition upon arrival. The Waipouli Beach Resort is a great resort in a very central location. We easily toured locations North and South of the resort. My family and I just returned from 13 nights on Kauai. H201 is a truly special unit at Waipouli. 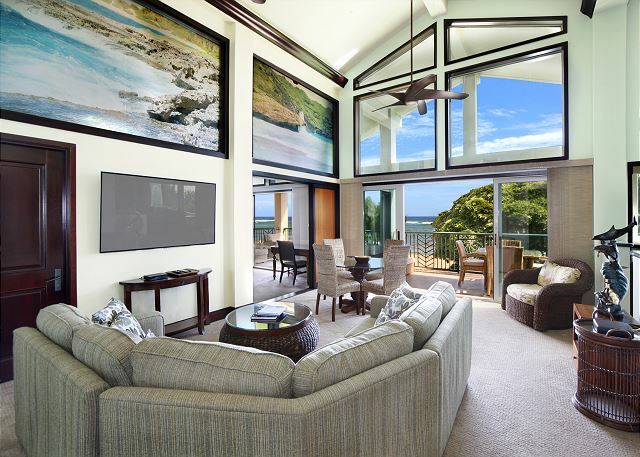 With its high ceilings, close proximity to the beach, and one of a kind art work this is a unit unlike any other. H201 was an over the top experience. Condo was beautiful,immaculate and in a fabulous location. It was wonderful sleeping with the ocean breeze and sound of the surf and waking up to the beautiful sun rise.Also, the beds were amazingly comfortable. 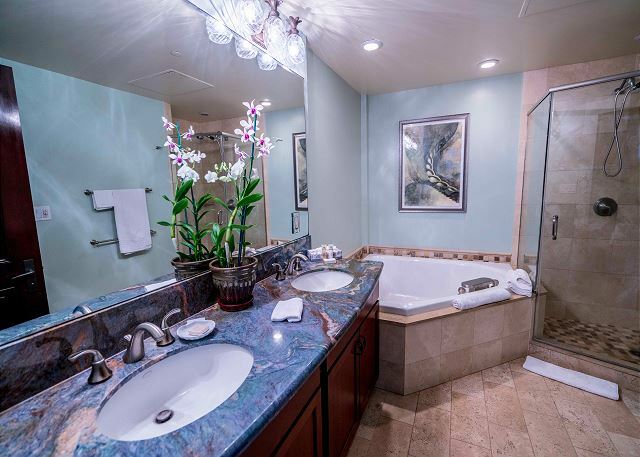 I have traveled all over the world and this was the nicest accommodations I have experienced.The management company was very professional and responsive to the my inquiries. My family would definitely choose this condo again. It did not disappoint. The pictures didn't do it justice either. The room with outstanding and the views were the best we've ever seen. Great location for the grocery store right across the street pretty much 40 minutes from anything on the island. Do you have to go to the tropical dream and get an ice cream when you visit there as well as Street burger. Great location, very close to the beach. Property manger was very responsive. Property is in very good condition. Had a blast at the penthouse at H201. 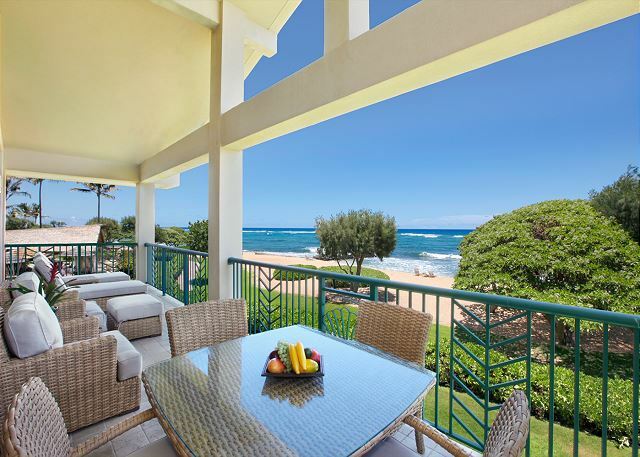 I would recommend this condo to anyone wanting to stay in the Kapa'a area of Kauai. 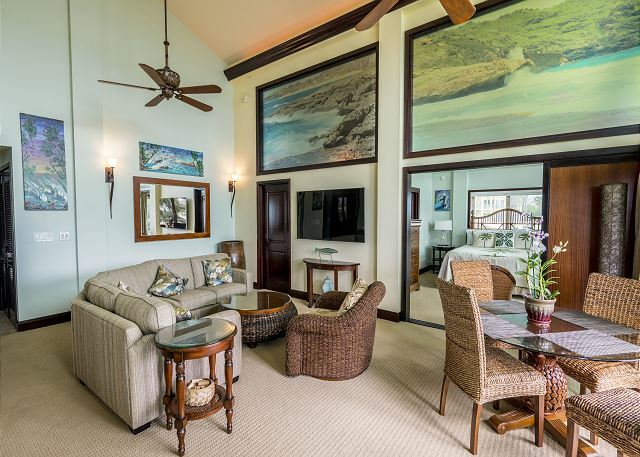 Convenient location, easy access to the beach, great finishes, and a tremendous view. Not sure what else one could ask for. It doesn't get any better than H201 at Waipouli. If you want the a great large layout, ocean front, two story windows to the ocean, a huge lanai and a 2nd large private lanai, high end furnishings and finish, wonderful kitchen, in-suite washer/dryer, large whirlpool bathtubs, incredible view, likely the best pool on the island, and the most convenient location for getting around Kauai, than this is your next rental. We already reserved for next year. The unit was all that is described. 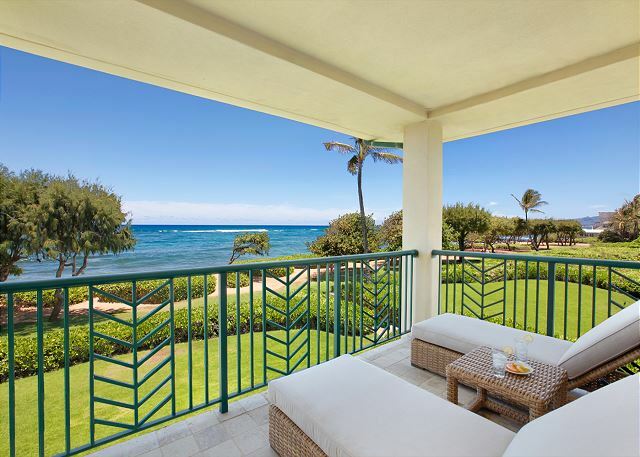 Open the doors to the huge lanai and relax listening to the ocean and looking at the sparkling blue waters. 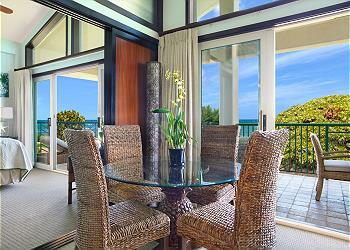 The outside area, closest to the ocean, is tremendously large with table for dinner or lounge chairs to relax. It was absolutely wonderful...best condo unit in the whole resort & closest to the beach! All the amenities needed plus close to Safeway across the street. Beautiful large 2nd floor deck but paint peeling badly on deck walls & ceiling from the salt air. The only thing wrong about the unit! Overall, H201 was even better than described and pictured on line! I was extremely satisfied with the condition of the unit. We have been renting condos on Kauai for many years. We usually rent several ocean front units for one to three weeks each during our 2 month stay each spring. This was our first stay at Waipouli, so we were not sure what we would find. We found an immaculately clean, well kept condo unit, much larger than expected. The beds and bedding were so comfortable, we slept very well. The televisions were huge; cable and Internet reception excellent; the furniture, modern and comfortable; the air conditioning excellent. The view was amazing from inside each room, as well as from the super spacious, super comfortable lanai. Oceanfront living was fabulous! Overall, a beautiful place we were fortunate to find. The occupied unit on the ground floor below could not be heard from our unit when we were indoors, but when they played the stereo loudly, the bass could be felt and heard, especially if they keep the doors open. The resort pool (maybe a few too many children for my taste, but that's just me) and restaurant (we enjoyed eating there twice) were very nice as well. The spa looked pretty, but was a bit pricey, even for Kauai, and the treatment was fairly average considering the automatically applied tip. I would rent this unit again, and hope to do so when we return next year. We have stayed many times at this resort but this is the first in this unit. It is quite simply the best unit at the best resort on the Island. Being centrally located allows you many more options than Poipu or Princeville. Kauai Exclusive management did an excellent job! We look forward to returning soon. Good location and excellent view. Nice facilities. Convenient access to all areas of the island. The unit is in good condition, but an older unit. Aloha from management! We reached out to the guest and asked them to clarify what they meant by "older unit?" 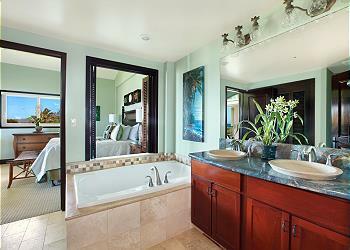 This 200 million dollar resort was completed in 2007 and this is the most exclusive suite on the property. The owner just invested nearly $80,000 on painting, new art, new furnishings, new Koa fans and more! The guest explained that the comment was made due to the unsightly exterior finish on the outside of the building. This developer defect is worse in some areas than others with the closest to the ocean being the most unsightly. This defect is being negotiated amongst insurance companies and attorneys at the moment and we are not able to resolve until a compromise or settlement. 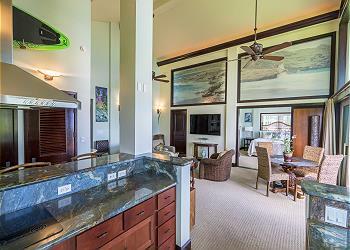 Please realize that besides the peeling exterior the suite is one of the finest beach front penthouses in Hawaii!! 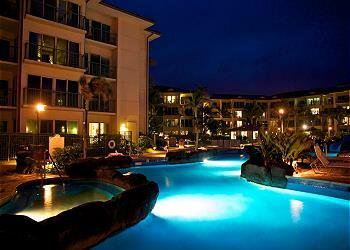 Wonderful resort and a beautiful island. Amazing unit on the best property on the island. Central location for day. Kitchen needs some upgrades. Microwave did not work. Range lights out. Freezer door hard to open.For this level of unit would have liked a few more items e.g. Measuring spoons, placemats, napkins, martini glasses, beach towels, silk plants. Comfortable beds and we all slept wonderfully to the sounds of the ocean. Mediocre shower head in master bath. Balcony furniture ready for an upgrade. Appreciated boogie board. Great privacy and absolutely fabulous views. Although not on the property, our concierge was very helpful. The condo was fabulous and the view of the ocean was breath taking.Location was great.We would most definitely return again. Great vacation. We stayed in this great unit for 5 weeks in August/September. It's a perfect location central to everything on the island and with shopping right across the street. The entire complex is first class and the location of this unit as the closest unit to the water could not be better. The unit itself is one-of-a-kind with two story ceiling/windows and tons of square footage. Inside the unit was high-end everything from the floors and doors to the dishwasher and built in washer/dryer. The unit was well stocked and equipped, and the huge balcony right on the beach was a big plus. We had a more than comfortable dinner for 10 people on this balcony and it could have been for 20! The great service and response from the entire staff at Kauai Exclusive Management could not have been more attentive and professional. These guys know how to make everything just right. True rock star living and service! We could not have been happier. We'll of course be back again in the future. HIGHLY recommend! Our family, husband, son and his new fiance spent five nights in H201. The two master suites gave us the privacy we were looking for and the kitchen, family room and lanais gave us the areas for family time. The view from all of the rooms was fantastic and the ocean breezes were wonderful. One of the showers quit working and the Kauai Management office had it fixed within 2-3 hours. The property was well maintained and we enjoyed swimming and relaxing by the pool daily. Kauai Exclusive Management was exceptional to work with; they are top notch and everything was exactly as described. We stayed in F304 and H201 and both units were incredible. We highly recommend this property and Kauai Exclusive Management. The only possible suggestion would be to install an outdoor shower near the pool for guests to rinse off sand from the beach. We stayed in this wonderful resort and room in Kauai with our 2 kids for spring break and this was the perfect spot. The kids loved going down the slides and exploring the waterfalls in the pool. We all loved the room right on the beach and it's vaulted ceilings and high end finishes. Josh and his staff at Kauai Exclusive Management went above and beyond to make our trip amazing. We will use them to book our rooms every time we go to Hawaii!! As always it was a wonderful experience. One small criticism is that the carpets need a good cleaning. This is a beautiful unit with an amazing view! We spent Thanksgiving in H201 and even cooked Thanksgiving dinner! Josh and Sheri were wonderful to work with and made sure that we had everything we needed! They took care of every detail and even welcomed us with fresh flowers and homegrown avocados in our unit at check-in! My family is looking forward to coming back to Hawaii and staying in H201, again! The Ocean view was spectacular!! The home was wonderfully furnished and decorated. It was spacious and well maintained. The homeowners welcomed you to the island and their condo, via a comment notebook. (nice touch) The Management Co. was very very helpful. We did not need their services, however if we had, we knew they were a phone call away. Only thing I would mention is bring your own hair dryer and the bed linens were a little weak. But with that being said, I would return in a heartbeat and would refer our friends. You can't go wrong with this unit. The luxury you'd expect with all the trimmings. Easy access to either side of the island. The view from the second floor patio was great. Hearing the ocean waves while preparing dinner in the professional kitchen was magical. Great place, great vacation! First time to Kauai and this was a fabulous experience. The rental was beautiful, and the resort was perfect. This is also an excellent location on the island. We will definitely come back and stay in this same unit. Every aspect of our experience was excellent. The property was exactly as it was promoted. The condo was spotless, had all the amenities (the full washer and dryer was a god-send), and we felt at home in every way. Relaxing, fun, and a totally wonderful place to stay. The pool was fun and refreshing. The kids loved the water slide and the water caves. 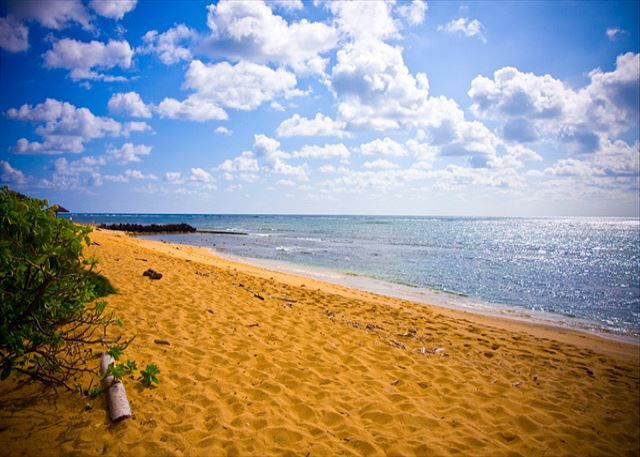 The property was steps to a clean fun safe beach. There is a shopping center across the street for anything we needed. I would not hesitate to visit this property again and again. You will not be disappointed in this property. Awesome place right next to beach. Huge place with a great VIP feel. Loved everything about it. I just wished we would have brought more people to enjoy the place with us. The location was amazing. The kids had a great time at the pool and we barbacued many nights during our stay. We arrived to complimentary pinnaples and papayas, as well as island chocolates. There were beautiful orchids throughout our rooms. We were also pleased with the lawn chairs and boogie boards we were able to use during our stay. Thanks Josh!!! We loved everything about this place. The unit was spectacular and the pool was fabulous. We really liked the restaurant too. Overall - 5 star! This was the best looking resort we saw on the trip. Only issues where pealing paint on the outside, the broken door nob The big issue was the fan in the master bedroom didn't work so when the doors where open at night that room got really hot the other bedroom was fine. We very much enjoyed our stay! The unit was everything we expected. It was gorgeous and an amazing place to stay on our vacation. It was perfect for our family, 2 grown sons, daughter-in-law, and grand-daughter, as it was very roomy. 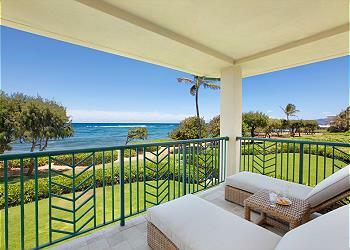 We had a beautiful view of the beach and ocean from our lanai and could easily see whales. I would recommend this to anyone visiting Kauai. 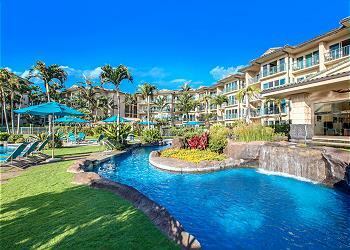 Perfect place to rent in Kauai. From booking to departure we had the most wonderful time. Best view, where else can you do dishes while looking at the beautiful ocean. COMPLETELY unobstructed view. The patio is huge. The kids had a blast hanging out there, and were safe. We will never be able to stay anywhere else, it was that perfect!! The location on the island was perfect too. You could get anywhere you wanted, north or south, easily. The pool is great for kids, but spread out enough that if you don't have kids, or want to deal with them, you can find a nice spot. Several nice places to eat with in walking distance. The on site restaurant was very good too. Safeway is right across the street (we stocked our huge fridge). Starbucks is by Safeway, but we found Coffee Bean just up the street (our favorite for treats). Loved our front view H201 condo for its location, comfort, privacy & spectacular views. The beds were very comfortable & the kitchen ideal for cooking and having another couple overto dine. The pool was very clean & relaxing even for our baby who tour around in a floatie. The restaurant was okay. The only bummer is that the elevator was out of service a lot of the time, but was fixed before day ended. Overall, we had a fabulous visit & look forward to visiting soon-aloha! It was wonderful! Great ocean view from the penthouse and plenty of space. Thank you so much, would highly recommend! The location cannot be beat and our family of four thoroughly enjoyed our stay. The unit itself was spotless and had all the necessary amenities. The resort which is large, never seemed too busy and we really felt that the number of people at the pool and beach was minimal. 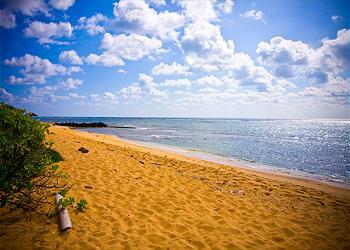 Our location made traveling to the west shore as well as the north shore extremely convenient. This unit's view cannot be matched and we would definitely stay here again. 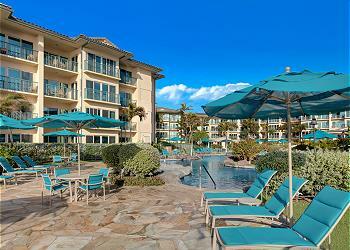 Mahalo to the management team who is very professional and welcoming. The Suite was great. We did not want to leave. There is no better condo in this development by far. Huge ocean front balcony. Two master suites, three bathrooms, large kitchen and two story great room worked extremely well for us. Great central location for exploring the island. We fealt special staying there. The view was great, the pool was very nice and not crowded. We enjoyed being able to find coves in the lazy river to wind down in. The beach is nice although a bit rocky for swimming. We did snorkel there. The weather was windy a couple days and tends to hit this side of the island. It was nice to have a restaurant on site for lunch and dinner. Overall a great week. 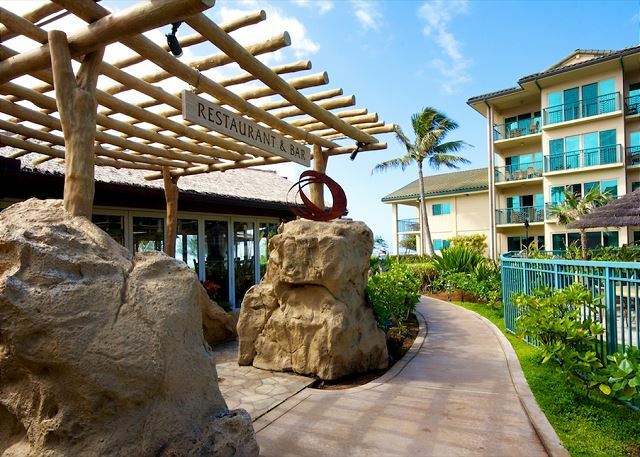 Sherri at Kauai Exclusive was extremely responsive. We are glad we stayed there. We had an awesome experience at the resort and especially our condo. Some days we would just sit on the lanai and read all day while watching the ocean and feeling the tropical breeze. Everything was great in the condo, wonderful appliances, a sub zero fridge and beautiful views from every room. The condo was clean and in great shape. Management could not be more helpful and accommodating. We stayed for two weeks and loved every minute. I would go back in a heartbeat. Thank you so very much for the experience. We traveled the Napoli coast and saw spinner dolphins, a seal, turtles and incredible landscape, took a helicopter ride, did some river kayaking and ate at amazing restaurants. Some of our favorites were Roy's, Portofinos, Dukes and Lemongrass. Thank you for an amazing relaxing vacation. stayed here for 8 nights and had a great time. Found the condo to be very comfortable, well appointed and great for our needs. This is an exquisite property with a location and ocean views that are second to none!The "soft goods", ie the sofa and bedspreads are tired looking and need replacement. Otherwise, a fabulous impression! We agree and replaced all of the linens.. We are committed to keeping it top notch! Rental experience was fantastic. Property was in great condition and very enjoyable. Only comments regard level of luxury for interior furniture. Beds matresses were too soft/worn matresses and sleeper sofa could use replacement. New furniture throughout would improve impression of unit. Family room wall TV too small for room and difficult to get 5 people sitting comfortably while watching TV. Kitchen pots/pans need replacement with may non stick pans scratched. We agree! We have a new mattress, improved interior furnishings & new pots and pans..
Waipouli H201 was an ideal accomodation for the two adult couples comprising our group staying for 6 days in Kapaa mid February, 2012. 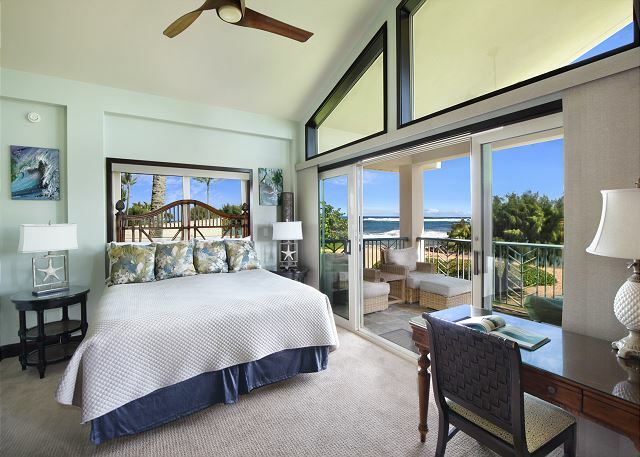 Both bedrooms are masters with king beds, whirlpool tubs, and showers with the biggest difference being a separate lanai off of one (although the other walks out to the huge main lanai). 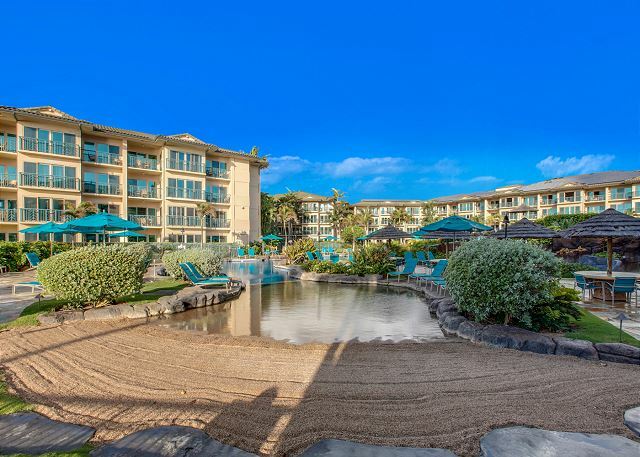 As an end unit closest to the beach, this place can be enjoyed as much or as little as a resort as one chooses with full resort access, but with direct views only of the stunning pacific ocean. The kitchen is well appointed with high-end appliances and the living areas inside and on the lanai were quite comfortable. We really enjoyed the outdoor furniture. Josh Rudinoff at Kauai Exclusive was friendly and easy to work with. I would give him and Waipouli H201 a high reccomendation and I wouldn't hesitate to stay there again. We had a wonderful stay and we loved the unit. We would definately come back again and stay. We thought the unit was perfect for us. Thank you. I don't think we could have asked for a better experience. It was an outstanding vacation. We loved the location and that the only noises we could hear were those of the ocean. The only cons we experienced were some of the cookware, e.g. the non-stick griddle, needs to be replaced, and we had difficulties connecting our tablets to the wireless (one connected on day 2, another connected on day 4, a third never did connect, but our laptop always connected with no problems). Some suggestions I would make to property management to include in the property instructions: the TV's have HDMI inputs so bring your own HDMI cable (to view pictures from your camera if equipped), how and when to use the dehumidifier, to turn on the bathroom fan while showering to reduce the amount of humidity, what to do with the linens before checking out, and that the stove takes a long time to heat up. I also wish there was somewhere to recycle papers and cardboard boxes. Overall a fabulous experience, and we will be back! 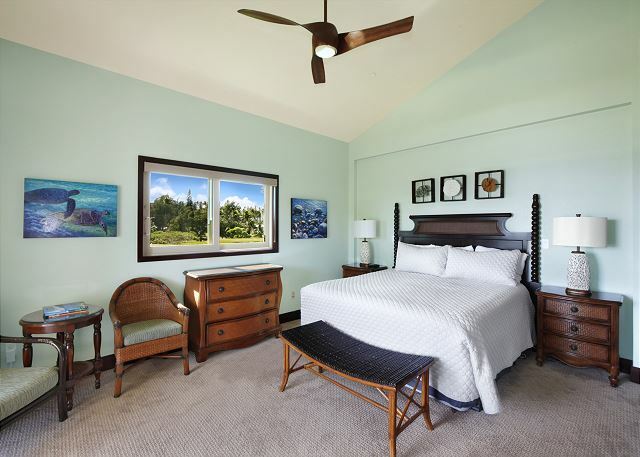 We had a wonderful time at this property and I would recommend it to anyone interested in incredible views and a great location from which to go just about anywhere on Kauai. The only complaint I have is the water pressure in the master bedroom - I tried to take a jacuzzi bath one night but it took nearly an hour to fill up the tub. Not worth it. The second jacuzzi, however, was great and my kids loved it so much they started asking to take multiple baths a day. Lots of great memories here! My only complaint is that the shower in the bathroom immediately to the right as you enter to unit is basically unusable. The water shoots out in thin sprays and never gets hot. We all had to use one shower the entire stay. We have fixed this with new shower head and realized the water heater was not set properly! the sunset over the ocean. Kauai is my favorite Hawaiian island - so laid back and beautiful. This was my second stay in H201, and I will come back. Spectacular property, very clean, great location, nice resort. We had a great time! Everything was spectacular. The only minor downside was a mechanical review of the plumbing and doors should be done. Aside from that all was picture perfect. What can I say - two large balconies oceanfront - saltwater breeze - listening to the waves - watching the sunrise and moonrise from the comfort of high quality outdoor lanai furniture - and indoors with soaring ceilings, luxurious bathrooms, comfy beds in large spacious rooms... want to feel like a "rock star" or "presidential" or entertain family and friends? Then H201 is for you! the unit has very nice finish out and is well located. There are a few "punch list" type items that need some attention, like a sink with no water, and no hot water in one of the showers. It is an extremely good value. 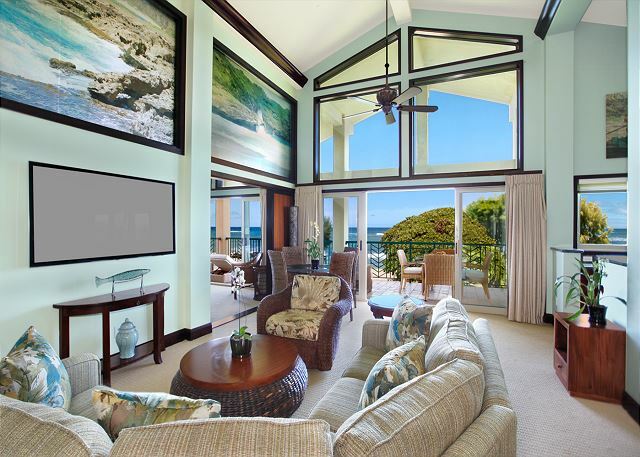 Un-surpassed ocean front location. Furniture could be upgraded to match the "Presidential Penthouse" location, design, and appliances.